Towards the beginning of summer, our little family took a vacation to Charleston, South Carolina for a week full of exploring, beaching & eating our way around town. No surprise with a busy summer packed of beach travels and oh you know, growing another human, I'm just now getting around to sharing our city guide from the trip! There's really no better feeling than having this rare travel time together as a family without any agenda, just a handful of really great recommendations from friends and a whole lot of flying by the seat of our pants. But traveling with a toddler meant all expectations and most parts of a "routine" got left at home, which my husband and I were totally on board with. Plus, having our own car made traveling at our own leisure so awesome, and made it super conducive to car napping. 1 | Sullivan's Island Beach: Hands down, our best days were spent at Sullivan's Island. We thoroughly enjoyed the serene and calm waters, and it's super wide, flat beach, filled with tot-friendly tide pools. 2 | Charleston Waterfront Park & Pineapple Fountain: Located right in the heart of downtown Charleston, this was a great activity our whole family enjoyed during the hot morning sun. The Pineapple Fountain is a wading fountain, perfect for cooling off, and there's also a splash pad and beautiful views of the harbor. 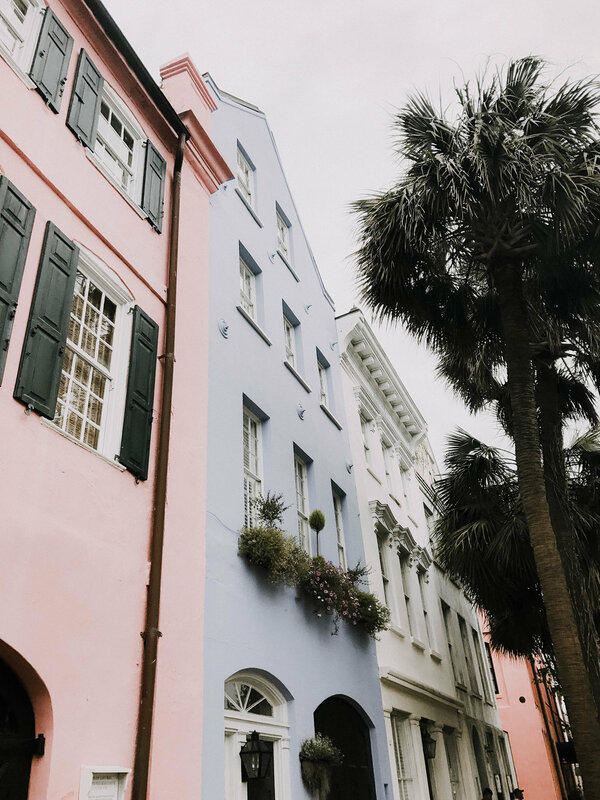 3 | Rainbow Row: A row of stunning homes in beautiful shades of every color of the rainbow, and there's a cute playground close by with a walking path that strolls right along the Battery. Also, a great photo op for you & your littles! 4 | Children's Museum of the Lowcountry: A fun place to let the kids run around, especially on those hot days or rainy afternoons. Faire loved the grocery room and the indoor wood playground. 5 | South Carolina Aquarium: This was top on our list for the first rainy day, but fortunately we had beautiful weather all week that we didn't get a chance to visit. Although, I've heard nothing but two thumbs up and it should certainly be included on your list. 6 | Mt. Pleasant Memorial Waterfront Park: A big, shaded playground nestled under the Ravenel Bridge, this was the perfect afternoon spot to visit which wasn't far from our Airbnb. There's a fun pier full of swings and long walking paths. 7 | Isle of Palms: Named for a reason, it's well worth the drive through town. Even if only to catch a glimpse of all those pretty palms lined in rows. 8 | Angel Oak Tree: Definitely touristy, but a fun morning or afternoon activity. And it's entirely free for everyone! It should be worth noting that you can't actually climb on the tree and visitors tend to stay more on the quiet side. 9 | Charleston Water Taxi: The water taxi links Mt. Pleasant to downtown Charleston and is a great way to catch a different view of the city. It runs hourly and kids 3 and under are free! 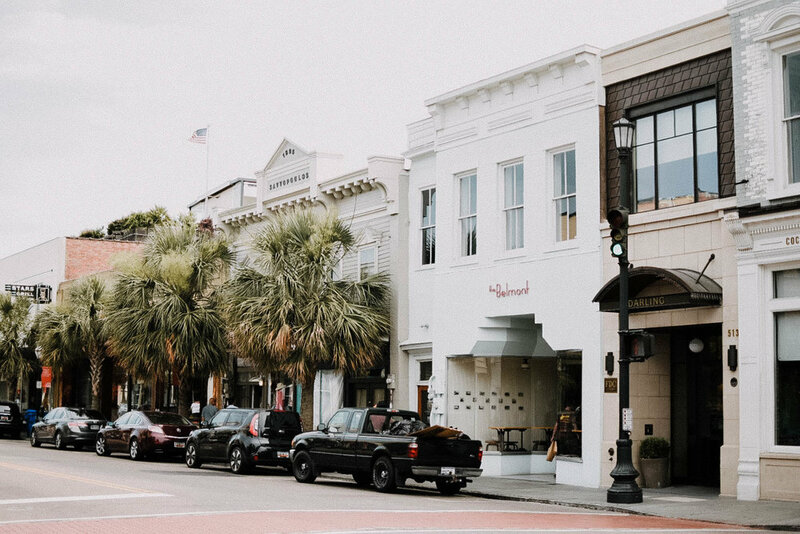 10 | Shopping: It's no secret, there's tons of spectacular shopping in Charleston. Since we were traveling with Faire, it wasn't a huge priority to go shopping, but I did my research and gathered a handful of shops that were highly recommended to visit. Candlefish (the most beautiful library of candles and even a small, curated section for kids - we splurged on this mermaid doll for Faire), Mac & Murphy (a stationer's dream, I snagged a few occasional cards for friends and the sweetest floral print for my mantle), Charleston City Market (it's a great open air market where you can find everything from sweetgrass baskets to locally-made gifts). 1 | Callie's Hot Little Biscuit: Worth. The. Wait. It's best if you are traveling with your partner and a stroller, leave one of you with the kids outside while the other one orders inside. We learned the hard way that the narrow restaurant is not stroller-friendly. But, more importantly, the biscuits and jelly were incredible! 2 | The Obstinate Daughter: A Sullivan's Island favorite! We snagged an empty table on their new-ish outside patio and had the best pizza and frites. I highly recommend the Old Danger pizza topped with a soft farm fresh egg! 3 | Black Tap Coffee: We really indulged on our caffeine all week and made sure to stop here 3 or 4 times. We also grabbed a bag of whole beans to bring back to Richmond, which we made the huge mistake of only buying one bag. 4 | Sugar Bakeshop: A quaint little small-batch cupcake & sweets shop covered in blankets of ivy, nestled away a few blocks from downtown. My favorite cupcake was the vanilla blueberry! 5 | The Daily: Only the best almond milk iced latte I've had ever. Also, the same owners as The Butcher & Bee, another local spot where you can grab delicious locally-sourced food. 6 | Taco Boy: I'm pretty much always craving tacos when we travel, so this spot became a quick favorite. I'd label this a trendy, cheap and quick bite, but with a fun atmosphere and huge outdoor patio. Lucky for us, this was the one meal all week where we had a snoozing toddler throughout the whole lunch. A+ fish tacos! 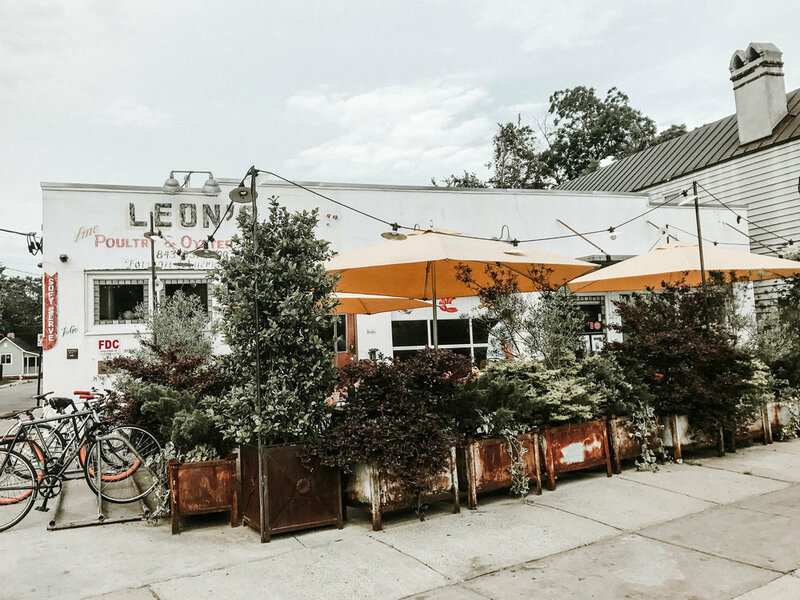 7 | Leon's Oyster Shop: A top recommended restaurant, close to downtown and majorly kid-friendly. Get the fried chicken, crispy catfish sandwich, or the Siam salad. 8 | Poe's Tavern: One of our best nights was spent scooping up fish tacos & nachos to-go and heading straight to Sullivan's Island for a dinner picnic on the beach. It was absolute perfection. 9 | Jeni's Ice Cream: Have you even seen a go-to list without Jeni's Ice Cream? Nope. The line was so long, but SO worth it. Faire was pretty antsy by the time we reached the front of the line, but mama's poached pear sorbet & the sticker roll at the end of the bar saved the day! 10 | Darling Oyster Bar: Well, we didn't get the chance to dine in this darling beauty right on King Street, but it made the list because it's apparently that good. It will be first on our list next time we visit. For those curious about our Airbnb - this is a link to the charming renovated carriage home we rented in Mt. Pleasant. I totally recommend this area, as it was a short 10 minute drive into downtown Charleston, but tucked away from the hustle and bustle, which in my mind was perfect for having a toddler in tow. Given the home is on the owner's property, we felt super safe, but still able to maintain a sense of privacy. Also, being in early pregnancy during this point, I was pretty fatigued most of the day and staying downtown towards the nightlife couldn't have been further from my ideal vacay.